Abida's singing of Sade Vere Aay Kare, adopted from the lyrics of legendary sufi poet Bulleh Shah, is one of my most favorite sufi song. Caution: prepare for an emotional roller-coaster ride o wanderers in the path! >> Watch the song via youtube HERE, which comes with english translation inside the video. grateful to RazaRumi for giving a better version of the song's rendition. then God would be found by fish and frogs. then God would be found by cows and buffaloes. God is found by hearts righteous and pure. but have you read your 'self'? have you tried to enter your 'self'? have you ever fought with your 'nafs'? :: alternatively for slower internet connection, you can listen only the audio from the album: Rooh E Sufi vol2., the track Sade Vere Aay Kare. 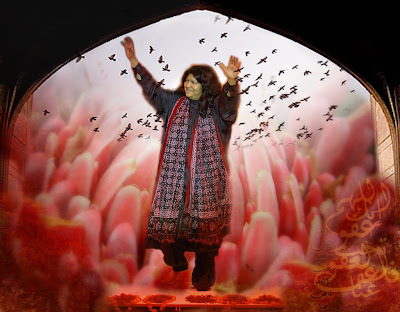 about Abida | Begum Abida Parveen (born 1954) from Pakistan is one of the foremost exponents of Sufi music. Her forte is the kafi and the ghazal, though she has also ventured into traditional male territory and sung qawwalis. Abida Parveen is known for the dazzling quality of her voice and her vivid musical imagination allied to her utterly feminine sensibility, all used to tell the Beloved the states His love makes us endure. She has a particularly stunning voice, a very unique one.